animals that we decided to dedicate a complete page to the Firebellies. The island of Roatán lies off the Caribbean coast of Honduras in the midst of the second largest barrier reef of our planet. 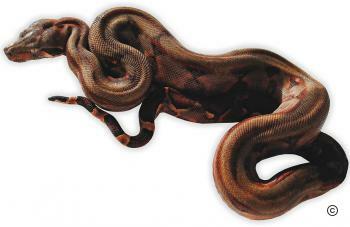 This island is 53 km (33 miles) long, about 5 km (3,11 miles) wide and harbors the probably most scarce color variant of island Boa c. imperator. These animals have become popular under the name ‘Firebelly’. The person who made the ‘Firebelly’ animals well-known is the breeder Dennis Sargent who lives in Florida. 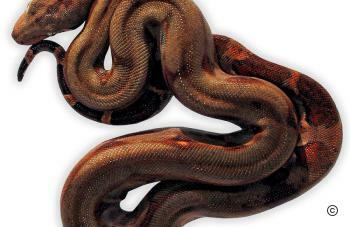 Some time around 1995, the US reptile wholesaler Tom Crutchfeld had imported several Boa c. imperator originating directly from Roatán. 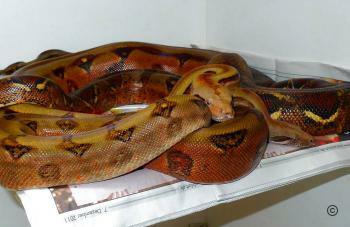 F1 offsprings of these snakes were subsequently offered for sale by the Florida reptile-seller ‘Glades Herp’. 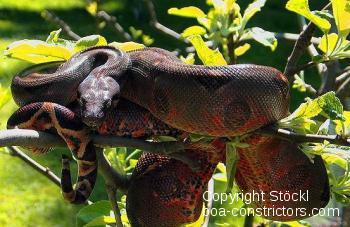 This group of boas also comprised a few peculiar individuals whose bellies and flanks bore a bright red coloration. Dennis Sargent selected the two pairs showing the largest amount of red and purchased them. The first reproductive success was achieved in 2000, and Sargent marketed the young under the handy label ‘Firebellies’. 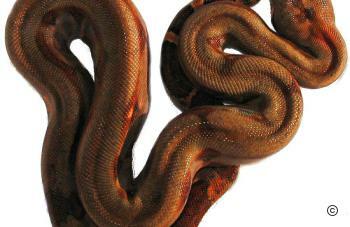 The contrast between the flaming red of the belly, which occasionally stretched to the flanks, and the otherwise dark brown or dark gray ground color makes up the specific visual charm of these rare Boa constrictor. 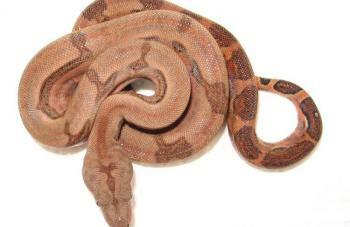 These island boas are a relatively small form of Boa c. imperator. The females hardly achieve more than 6ft in length. Although we applied a generous feeding schedule on our cb 2000 female she has not gained more than 5ft in length. Because of a profession change, Dennis Sargent was forced to stop keeping snakes temporarily some years ago. Unfortunately, his excellent breeding animals were scattered to the four winds when his collection was broken up. 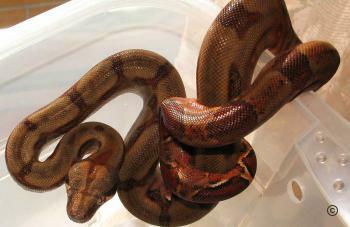 This process included the ‘Firebelly’ boas. Until June 12, 2007 (when we succeded to breed Firebellies for the first time) only four specimens of the ‘Firebelly’ variety were known to exist in Europe. They result from two litters (F1 generation) bred by Dennis Sargent in 2000 and 2001. Up to our first breeding success, there was no chance of getting similar animals. Even Dennis Sargent, who has temporarily taken up his hobby again, did not succeed in finding these snakes again. Nevertheless, it did not take much time before the first alleged ‘Firebellies’ were offered to candid prospective takers. However, these animals were actually just reddish specimens of the Honduran mainland variety which is being bred quite regularly. As far as ‘true’ Firebellies are concerned, their origins MUST be traceable to Dennis Sargent. If this is not the case, someone is just trying to do you out of your hard-earned money.